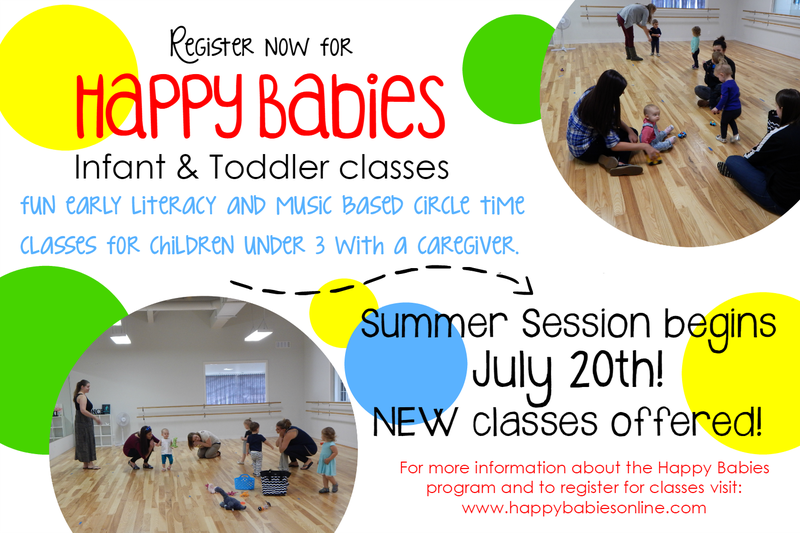 Announcing summer programming at Happy Babies! 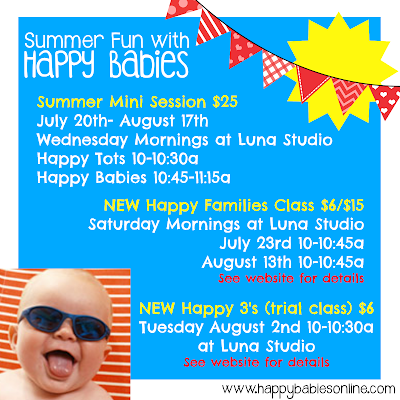 We will be having a 5 week mini session of Happy Babies & Happy Tots classes on Wednesday mornings at Luna Studio in Rockford. (please note that Happy TOTS is first from 10-10:30a, then Happy Babies will be at 10:45a) Cost is $5/class to drop-in or $25 for the whole session. We are excited to also announce some NEW programs that we will be trying out during the summer session. Introducing Happy Familes Class AND Happy 3's Class! Happy Families Class is for families with children age 5 and under and is designed for the whole family to come have fun together (big siblings are welcome to come as helpers). We will be having fun as a family through music and movement, large motor activities, and an art project! Cost is $6 for each child age 5 and under, or $15 per family. Has your child outgrown Happy Tots? Now there is a class just for our preschoolers! Happy 3's is a preschool readiness class for children who are 3 years old and are not yet attending preschool. Our focus will be on language, social, and fine motor development. We will be having fun with literacy activities like stories, rhymes, and songs. We will be playing cooperative games and practicing our listening skills. At the end of class we will work on an art project that encourages fine motor skill development. I can't wait for the summer session of Happy Babies! Click HERE for even more information about classes and to sign-up. Just now learning about Happy Babies? Click HERE to learn more about the program and classes! Are you going to have afternoon classes? Not for the summer session. In the fall session we will offer an afternoon class in Ashton as well as an evening class in Rockford. When will the Fall brochure and registration be out? Hi Sophie! I am currently working on finalizing the schedule, registration will be open in the next few days!